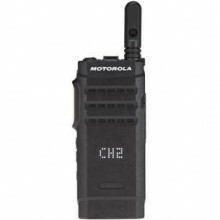 MOTOTRBO™ SL1600 provides reliable push-to-talk communication for the mobile, everyday user in an ultra-slim and rugged profile. Whether you’re working in the field or at a black-tie event, the SL1600 is boldly designed to keep you efficiently connected. Measuring only 22mm thick, the SL1600 is ultra-portable. A stubby antenna, curved edges and rugged frame make the SL1600 the perfect work partner. It can be easily carried in pockets or bags without snagging or bulging. Designed for easy and intuitive use, the SL1600 has a side volume control, dedicated power button, prominent push-to-talk button, and top toggle channel switch to enable quick one-hand access. Channel “fast toggle” allows users to scroll through 10 channels at a time. The SL1600 is outfitted with the latest technology for performance and ease of use. The shatterproof Active View display uses a matrix of LEDs behind the radio housing to communicate radio information and shuts off when not in use to conserve battery life. The SL1600 features Range Max technology: an advanced radio design and patented antenna which delivers enhanced range while maintaining a slim profile and long battery life. The SL1600 is built to last. IP54 rated for dust and water resistance, it can be used even in harsh environments. This radio can survive many drops and tumbles. It has also been proven tough in Motorola’s gruelling Accelerated Life Test, where the radio is tested against a simulated 5 years of hard service before it is accepted. Measuring only 22mm thick, the SL1600 redefines portability. It can be carried easily in a pocket or bag without catching or bulging. The SL1600 features a separate power button, top channel toggle switch, side volume control buttons, and prominent push-to-talk button to support one-hand radio operation. Get all the benefits of digital, including better voice quality, better range and better battery life—but retain compatibility with your existing radio fleet. With Analogue and digital capability, you have the freedom to migrate to the latest technology at your own pace. Utilise the power of the 2-slot TDMA DMR standard to double the capacity of your 12.5 kHz channel—without the need for a repeater. Rugged and reliable, the SL1600 is splashproof and dustproof for use in harsh environments. Innovative carry options, earpieces and charging stations allow you to get maximum efficiency from your SL1600.